Mazda to Renault | What Car? Mammothcars.com will save you 1315 on the Mazda 2 1.6D 95 Sport. Price you pay: 13,450. Save 2555 on the Mazda 3 1.6D TS2 from Drivethedeal.com. Price you pay: 15,670. Drivethedeal.com will save you 2717 on the Mazda 5 1.6D TS2. Price you pay: 17,938. Buy a Mazda 6 2.0 155 TS2 estate from Drivethedeal.com and save 3447. Price you pay: 17,858. Go to Autobytel.co.uk for a 2142 saving on the Mercedes A160 CDI Blue Efficiency Classic SE. Price you pay: 14,983. A saving of 1830 over list price from Uknewcars.com on the Mercedes C220 CDI Blue Efficiency coupe. Price you pay: 30,750. Save 1830 from Uknewcars.com on the Mercedes C220 CDI Blue Efficiency coupe. Price you pay: 30,750. Go to Autobytel.co.uk for a 4117 saving on the Mercedes C200 CDI Blue Efficiency Elegance. Price you pay: 24,088. Pay 2801 less than list price on the Mercedes CLS350 CDI Blue Efficiency Sport saloon with Drivethedeal.com. Price you pay: 50,192. Autobytel.co.uk will save you 4729 on the Mercedes E250 CGI Blue Efficiency Avantgarde. Price you pay: 29,856. Get a 5604 saving on the Mercedes E350 CDI Blue Efficiency Sport Estate with Autobytel.co.uk. Price you pay: 35,331. Pick up a 7438 saving on the Mercedes S350 CDI Blue Efficiency at Motorlogix.com. Price you pay: 54,242. 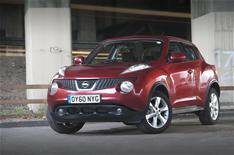 Carfile.net will save you 1378 on the Nissan Juke 1.6 Tekna. Price you pay: 15,017. Save 2786 over list price on the Nissan Qashqai 2.0 dCi Tekna 4WD with Carfile.net. Price you pay: 22,759. Carfile.net will save you 3142 on the Nissan X-Trail 2.0 dCi 173 Tekna. Price you pay: 25,738. Buy a Peugeot 508 SW 1.6 THP 156 Allure from Carfile.net and save 2104. Price you pay: 22,116. Check out Mammothcars.com for a 2421 saving for the Peugeot 3008 2.0 HDi FAP 150 Sport. Price you pay: 18,729. Save 2232 from Mammothcars.com on the Peugeot 5008 1.6 VTi Sport. Price you pay: 17,373. Go to Drivethedeal.com for a 1886 saving on the Peugeot RCZ 2.0 HDi 163 Sport. Price you pay: 21,164. Pay 2483 less than list price on the Renault Clio 1.2 TCe 100 Dynamique TomTom 5-dr with Drivethedeal.com. Price you pay: 11,217. Pick up a 4322 saving on the Renault Megane 1.5 dCi 110 Dynamic TomTom at Coast2coastcars.co.uk. Price you pay: 14,383. Dealer Bristolstreet.co.uk will save you 2610 on the Renault Wind 1.2 TCe 100 GT Line. Price you pay: 13,495.